Hames Size 22" 24" 26" 28" 30"
This is the most universal harness you can own! Use it around the farm, to show, or just for pleasure driving. 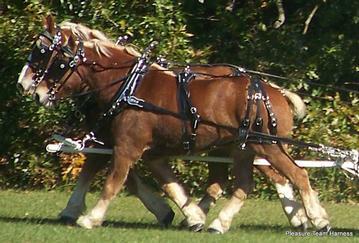 You can use this harness to drive a team or two separate cart horses. Dress your horses up with some added decorations on the harness (like pictured) or keep it plain and simple for everyday use! This harness is designed to be durable and functional, and yet light weight and easy to handle. When harnessing and unharnessing, the harness will be in three different parts; the breeching, back pad/belly band, and the hames and traces. 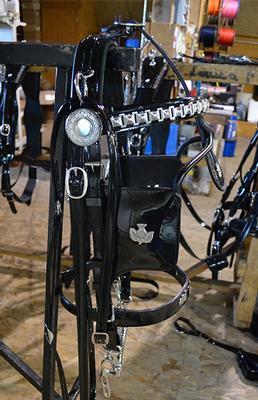 By coming apart, it makes the harness easier to handle as you won't have to throw the entire harness over your horse at one time. Complete Team Set Includes: martingales, bridles with built in cavesons and continuous bit straps, stainless steel hames, collar drops, 2 sets of cart lines, 1 set of team lines, 2 single shaft loop combinations, 3-strap britchen, ornaments and chain. Also available as a single harness. Only Available in Bio Plastic or Granite.